There is no problem down to the smallest egotistical longing which the Gestapo cannot solve. Regarded in this way we are, if a joke is permitted, looked upon as a cross between a general maid and the dustbin of the Reich. 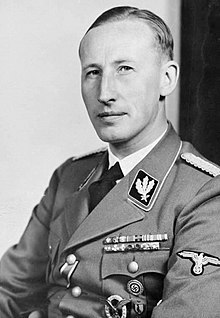 Reinhard Tristan Eugen Heydrich (7 March 1904 – 4 June 1942) was an SS-Obergruppenführer, chief of the RSHA and Reichsprotektor of Bohemia and Moravia. 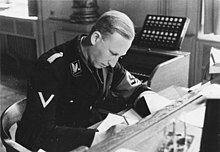 Heydrich chaired the 1942 Wannsee conference, which finalized plans for the extermination of all European Jews in what is now referred to as the Holocaust. 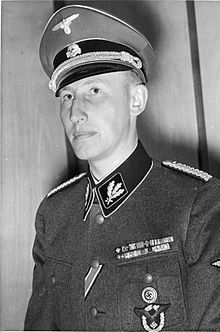 Heydrich was wounded in an assassination attempt in Prague on May 27, 1942 and died over a week later from complications arising from his injuries. Ernst Kaltenbrunner was his successor and saw to it that the exterminations were carried out as planned. Europe is to be combed from East to West for Jews. Vain as a peacock, but mockingly aware of his vanity, clever, perhaps too clever by half, and contemptuous of the clumsiness of most of his colleagues and superiors, he nevertheless could be clumsy in his use of force and, unlike Himmler, was liable to over-reach himself. He was very young, very handsome, save that his eyes were too close-set; an outstanding example of that blond mixture of effeminacy and toughness which may be observed in any Teutonic night-club. He had immense drive, which was liable to carry him too far; total ruthlessness in the attainment of his own ends, which were wrapped up in personal ambition; no active enjoyment of cruelty except sometimes, perhaps, almost as an afterthought; and a devilish sense of humor. Vain as a peacock, but mockingly aware of his vanity, clever, perhaps too clever by half, and contemptuous of the clumsiness of most of his colleagues and superiors, he nevertheless could be clumsy in his use of force and, unlike Himmler, was liable to over-reach himself. He was dynamite, like a character in an American gangster story; and in the S.S. he was able to canalise his nihilism into a constructive purpose. What ever actions he took he carried them out as a National Socialist and an SS man, from the very bottom of his heart and through his blood, he carried out felt and understood Adolf Hitler's world vision. He was inordinately ambitious. It seemed as if, in a pack of ferocious wolves, he must always prove himself the strongest and assume the leadership. One of the best national socialists, one of the best believers in the German ideology, and one of the greatest opponents to all enemies of the Third Reich. Truth and goodness had no intrinsic meaning for him; they were instruments to be used for the gaining of more and more power. To debate whether any action was of itself right appeared so stupid to him that it was certainly a question he never asked himself. He was a terribly ambitious man with a great craving for power. This desire for power was measureless, and he was extraordinarily clever and cunning. The irreplaceable loss of the most radical and successful persecutor of all enemies of the state. This page was last edited on 26 January 2019, at 23:01.